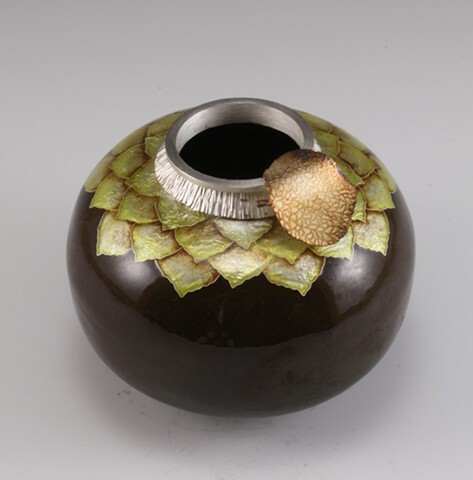 This piece, Brown Aspen Vessel, uses the cloisonné enameling technique to describe a design formed by overlapping aspen leaves. The textured rim is formed from sterling silver, as is the one aspen leaf that rests upon it. That pale yellow silver leaf is etched with the delicate pattern of veins replicating an actual leaf. The image of the vessel on this website portfolio is an example of the Aspen Leaf Vessel series but each piece is hand-made by the artist and has its own distinct features.